The configuration settings affect how the listener service behaves and these options are specified in the LyncDialogListener.exe.config file. The configuration files are located in the Lync SDN API 2.0 installation directory. By default, the path to this directory is C:\Program Files\Microsoft Lync Server\Microsoft Lync SDN API\. The following section describes how to configure Lync Dialog Listener. Follow these steps to modify the Lync Dialog Listener logging configuration. Open the LyncDialogListener.exe.config file with a text editor. Search for the <loggingConfiguration> section and make appropriate changes to entries under the <Listeners> elements. The configuration file can be conveniently inspected and modified using the Microsoft Enterprise Library Configuration Tool. For more information, see Microsoft Enterprise Library. Each entry (an <add> element) under <listeners> corresponds to a specified type of logging. Modifications can include adding a new <add> entry to enable the specified type of logging, removing an <add> entry to disable the specified type of logging, and changing an existing <add> entry to modify the specified type of logging. Logging the application execution states, including Debug, Info, and Error types of data. The output is recorded in the LyncDiagnostics.log file. Logging all types of data, including SIP messages with SDP headers, quality of experience data and error messages when errors are detected by Lync Dialog Listener. Logging the quality of experience raw data from the Lync Server and error messages when errors are detected while the QoE report is processed. Logging the dialog data, including SIP messages and some SDP headers and error messages when errors are detected while the SIP dialog event is processed. The following example shows the LNEAppLog type of logging options containing a modified logging file path (in the boldface text). 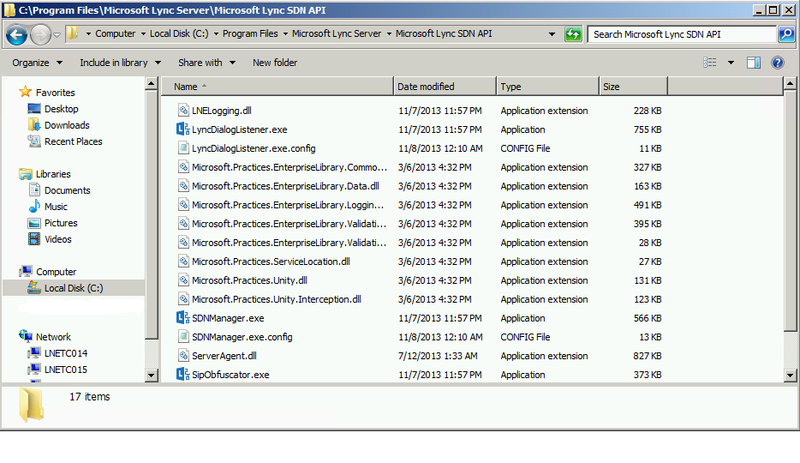 Follow these steps to modify the Lync Dialog Listener (LDL) execution configuration. The configuration for executing the LDL service is flexible. The following table shows a few options, as an illustration. Set the value of the web address for the LSM. The string value "yourSDNManager" is a placeholder and you should replace it with the name of your SDN manager. This is populated by the installer but can be updated through this configuration. Set the value of the web address for the alternate LSM that should be used for failover. You should replace "yourSecondarySDNManager" with the name of your secondary SDN manager. Set value to false to receive QoE information only for bad calls. Set value to true to see QoE information for all calls. Set value to false to not notify about an upcoming call as indicated with an INVITE message. This event precedes a StartOrUpdate event which is initiated by a 200 OK for the SIP INVITE. Set value to true to send INVITE messages. Set value to a thumbprint of the certificate to use for client certificate authentication. Set the value attribute to "true" to see Lync Meeting Room endpoint related information. Otherwise, Lync Meeting Rooms will not be specifically identified. Set value to the name of QoE database from which thresholds for bad Lync calls are received. If a database name is entered here, Lync SDN API will use the database-defined thresholds. Otherwise, threshold values are also specified in the LyncDialogListener.exe.config file. Set value to the user name for signing in to the QoE database as specified in the database setting above. Windows credentials of the user account running Lync Dialog Listener will be used to access the database. In a trusted connection, set value to an empty string and the credentials of the current user will be used to access the QoE database. Set value to the password of the user above as part of the credentials to log in to the QoE database. In a trusted connection, set value to an empty string. Set value to either Acceptable or Optimal as the threshold for defining poor quality records. The values are defined in the QoE database. By default, Lync Dialog Listener uses the Acceptable level to identify bad QoE quality. Set value to the maximum unanswered and waiting messages to send to LSM. Change this value only if network conditions require a longer queue length due to delays in messages being received. The following example shows an excerpt of a Lync Dialog Listener execution configuration, specifying where (submituri) to post the diagnostic data (sendrawsdp, sendallcallqoe, sendmeetingroominfo), how to submit the data, and what quality of experience metrics (qualityThresholdLevel, audio-DegradationAvgOptimal, audio-DegradationAvgAcceptable) to use in provisioning of the Lync network diagnostic data to a network management system.